Wow, that thing looks like all kinds of trouble. Pretty cool. Awesome, it needs the cat brain AI that the pentagon is developing. Squirrels beware! Cats are hard to train. Dogs are easier. ???? I’m keeping an eye on this for more documentation. I’ve got a hill and a reel mower just asking for this. I’ve done much the same thing with the same mower, and he’ll want to be careful that the electric motors don’t break the spindles. The power is sent through the wheels and to the reel with a simple – but fragile – plastic/metal connection, and once this thing gets in grass, sudden starts can easily strip it out. In fact, I’m considering having replacements milled in steel. this pretty much defeats the purpose of a reel mower, but it’s a cool idea. I was thinking of making a town behind reel mower for my kids trike. child labor? I was thinking of a similar bot but instead of driving the wheels directly have a separate drive system behind it. This way its always moving with the wheels I use rather then the slicker stock wheels. Also it would be easer to remove in the event you had to use it manually. I learned this on a visit to the groundskeeper shack at a golf course, they use multiple (ganged) rotary blades, 6 or so per mower, I think the blades were driven hydraulically, neat tech for sure. Awesome hack, he could use some pneumatic tyres from a riding mower, I wish I could find a lawnmower junkyard to strip parts from. I wanna see cameras and transmitters and hey IR lighting for night mows! Believe me I know the benefits of reel mowing, I have been using one for 3 years…. It’s a neat project but i appreciate reel mowers for their people power ability. I would like to see a gang pulled by bike or trike, or a team of harnessed pugs…. but I have too many projects. Trike mowing, I am intrigued. Even better if there is a way to people power it without going along for the ride, perhaps via a tramline so you sit at the end and pedal while the mower goes across the lawn. the harness for the pugs would dangle a sausage or some other tasty treat just out of reach. If you want documentation, there is plenty, check out a few Road Runner cartoons. Wile E. Coyote had several proof of concepts. However, as I stated on the last lawnmower hack, this is simply going to lead someone to lose a lawnmower wide swath of fur going up their back. It would be really cool if the Energetically Autonomous Tactical Robot (EATR)™ technology was mature enough to graft on to this idea. 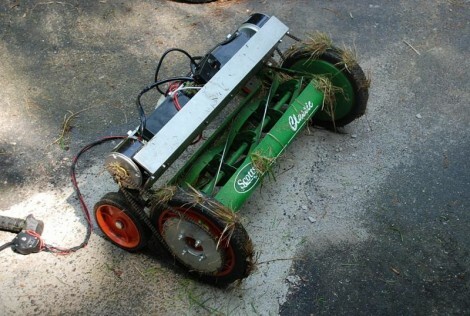 I’d make a Roomba shaped lawn bot with dual blade reel and sweeper/collector reel. This would be a slow mower. It would collect lawn clippings and either directly digest and power itself or repeatedly return to a stationary digester that would covert and charge a battery instead. I like the idea of calling it “The Electric Sheep”.